^ Physiographic Diagram of Australia, A.K. Lobeck, by The Geological Press, Columbia University, New York, 1951. ... "to accompany text description and geological sections which were prepared by Joseph Gentili and R.W. Fairbridge of the 西オーストラリア大学"
^ MSN Encarta (2006). “Great Barrier Reef”. Great Barrier Reef. 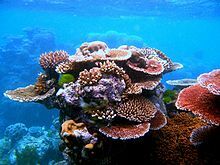 http://encarta.msn.com/encyclopedia_761575831/Great_Barrier_Reef.html 2006年11月11日閲覧。. ^ Dobbs, Kirstin (2007) (英語) (PDF). Marine turtle and dugong habitats in the Great Barrier Reef Marine Park used to implement biophysical operational principles for the Representative Areas Program. Great Barrier Marine Park Authority. http://www.gbrmpa.gov.au/__data/assets/pdf_file/0007/18799/rap_turtle_and_dugong_bop.pdf 2010年10月23日閲覧。. ^ Kent, David; Smithers, Scott G.; Parnell, Kevin E. (2007). The geomorphology of the Great Barrier Reef : development, diversity, and change. Cambridge : Cambridge University Press. pp. 450–451. ISBN 0521853028. ^ Fernandes et al. (2005) Establishing representative no-take areas in the Great Barrier Reef: large-scale implementation of theory on marine protected areas, Conservation Biology, 19(6), 1733-1744. ^ “Ecological Economics Criteria for Sustainable Tourism: Application to the Great Barrier Reef and Wet Tropics World Heritage Areas, Australia” (英語). Journal of Sustainable Tourism 4 (1). (1996). http://www.multilingual-matters.net/jost/004/0003/jost0040003.pdf 2010年10月23日閲覧。. Hopley, David; Smithers, Scott G.; Parnell, Kevin E. (2007年). The geomorphology of the Great Barrier Reef: development, diversity, and change. ケンブリッジ大学出版局. ISBN 0521853028. http://books.google.com/books?id=omr72hD6dvQC&printsec=frontcover. Bell, Peter (1998年). AIMS: The First Twenty-five Years. Townsville: Australian Institute of Marine Science. ISBN 9780642322128. Bowen, James; Bowen, Margarita (2002年). The Great Barrier Reef : history, science, heritage. Cambridge : Cambridge University Press. ISBN 0521824303. Done, T.J. (1982年). “Patterns in the distribution of coral communities across the central Great Barrier Reef”. Coral Reefs 1 (2): 95–107. doi:10.1007/BF00301691. Hutchings, Pat; Kingsford, Mike; Hoegh-Guldberg, Ove (2008年). The Great Barrier Reef: Biology, Environment and Management. CSIRO Publishing. ISBN 9780643095571. Lucas, P.H.C. et al. (1997年). The outstanding universal value of the Great Barrier Reef World Heritage Area. Great Barrier Reef Marine Park Authority. ISBN 0642230285. Mather, P.; Bennett, I., ed (1993年). A Coral Reef Handbook: A Guide to the Geology, Flora and Fauna of the Great Barrier Reef (3rd ed.). Chipping North: Surrey Beatty & Sons Pty Ltd. ISBN 0949324477.